Where dogs and cats are kids! Drop-off DayPlay, DayBoard, and DaySchool are available Monday through Friday and come in a variety of options that are individualized for your pet. Our convenient drive-thru makes drop-off and pick-up a breeze. On weekdays, lobby hours are from 7:00 to 9:00 in the morning and from 4:30 to 6:30 in the afternoon. Alternate drop-off and pick-up times can be arranged in advance. DayPlay is available to our boarders on weekends. Please call (765) 429-4050 to discuss options for these programs with the DWK staff. 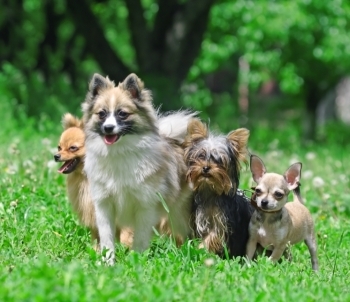 Pets enrolled in DayPlay can socialize with people and new pet friends. DayPlay activities range from individual sessions with staff to vigorous romps with new pet friends in our indoor and outdoor parks. Nature walks on wooded paths are a new option. Pets wanting to enroll in group DayPlay must be assessed for social compatibility and play style before being allowed to join group activities. Make an appointment for a one-hour DayPlay Enrollment Assessment (a one-time $40 fee) or an Assessment Stay-and-Play ($55 for the first day). Purchase a 10 day package for $250.00 for use within a year. Many of our boarders participate in DayPlay for a discounted rate of $18 a day while boarding. Drop-off DayPlay for non-boarders is available only Monday through Friday. DayBoard accommodations include all the amenities of our standard boarding. DayBoard is perfect for the pet who needs some daytime monitoring or extra potty walks. Pets who want to watch the activity without breaking a sweat will still receive customized individual care with DWK DayBoard. DayBoard is also ideal for the pet who does not play well with others but who needs daytime care and attention. DayBoard clients are housed in an appropriate-sized room and charged accordingly. DayBoard is available Monday through Friday. Weekend DayBoard is dependent upon census and subject to an additional drop-off or pick-up fee. Small changes can make big differences! DWK is pleased to be able to offer weekday lessons as an add-on to DayPlay, DayBoard, or regular boarding. Lessons are $30 each. The first lesson includes a consultation with Dani Sosbe, our DWK Training Coordinator, who will perform a status assessment and conduct a mini-lesson with your dog, prepare a plan for your at-home follow-up, and create a proposal for an individualized training program for your pet. Whether you are wanting to improve communication, skills, performance, or relationship, the DogWood staff are eager to help.